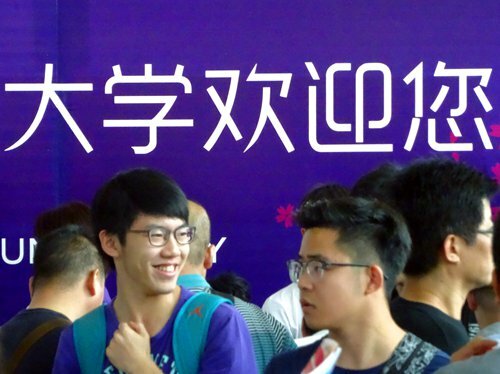 As almost 10 million high school graduates apply to college after sitting this year's national college entrance examinations, known as the gaokao, some candidates with outstanding scores are finding that their applications have been altered by their teachers without their permission. Many high schools either persuade or force their top students to apply to either Peking University (PKU) or Tsinghua University, the two most prestigious universities in China. Some schools have even been caught altering students' applications forms. Behind this are local high school evaluation systems which grant marks to schools based on how many of their students are admitted to PKU and Tsinghua. Several students from a high school in southern China said that their school's president asked some 20 students with gaokao scores above 660 - out of a possible 750 - to only apply to the Peking University Health Science Center (PUHSC), a member of staff in charge of recruitment at a top university told the Global Times. PUHSC usually has a lower gaokao score requirement than other majors at PKU. At a different high school in the same province, a student was prevented from leaving an office for six hours by several faculty members who tried to persuade him to apply to PUHSC. The stubborn student was summoned to the president's office the next day and forced to write PUHSC on his application form. Fortunately, the student was able to change his online application form five minutes before the application system closed, the recruitment teacher who tipped off the Global Times said. To protect the students, their names and the schools' names were not revealed. "Persuading" students to apply to PKU or Tsinghua is common in many provinces in South and Central China. One high school president even collected top students' online university application platform account numbers and passwords, allegedly changing one student's application to be for PUHSC without permission. While the president of the school denies that he changed students' application forms, he admitted that PKU is very important to the school and claimed students who do not apply to PUHSC have "failed the school," according to a recording of a phone call obtained by the Global Times. Several graduates of another high school told the China Youth Daily that all the students at their school had to hand in a draft application form before the online application process started, and only those drafts that had been signed by the dean could be sent off. One female student allegedly cried for two days outside the dean's office, as the dean refused to sign her form unless she changed to her major. Education plans that focus on simply hitting numerical targets should be blamed for such phenomenon, according to the university staff member that tipped off the Global Times. According to a local evaluation standard revealed by the tipster, local high schools receive extra points for each student that is enrolled by either PKU or Tsinghua. In response, local high schools separate students according to their performance - a class for potential PKU and Tsinghua candidates and a class for everyone else, the China Youth Daily reported. "Such phenomena are getting worse in China in recent years, as local governments' evaluation of high schools shifted from the number of students who get into college to the number that enroll in top universities especially PKU and Tsinghua," Xiong Bingqi, deputy director of the 21st Century Education Research Institute, told the Global Times. Xiong said that interfering with students' applications is a violation of their rights, deviates from equal competition among colleges and could generate adverse effects. "Apart from the high school evaluation system, public opinion and the wide media coverage of students who are admitted to the two universities worsens the situation," Xiong said.